Please join Kehilla’s Greening and Middle East Peace Committees for a potluck dinner on September 16 at 5:30pm and fundraiser to support the children of Gaza. Gaza is still recovering from fifty-one days of bombing in 2014. Electricity, water, and sewage systems are all still very fragile, and more than 17,000 people are still in temporary housing. Families there are affected daily by rolling black-outs. Far too often electricity is only available for 4 hours per day. Children must do their homework by dangerous kerosene lamps or candlelight. For the last year, the Rebuilding Alliance, a local non-profit organization, has been fundraising and shpping solar powered lights to Non-Governmental Organizations in Gaza. Our goal is to help raise funds to help them send the next pallet of 1,920 solar-powered lights to Gaza’s children. Our speaker for the evening will be Donna Baranski-Walker, founder and Executive Director of Rebuilding Alliance, who was in Gaza in April to distribute the first pallet of solar lights. 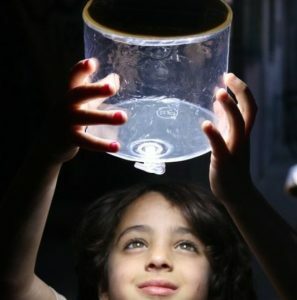 Rebuilding Alliance is working with Palestinian Non-Governmental Organizations in Gaza to distribute the solar lights to children and families in need. Donna will explain how Rebuilding Alliance is able to send the solar-powered lights through the blockade following pre-clearance by both Palestinian and Israeli Customs. She also will tell us about their NGO partners and some of the families she visited in Gaza. This will be a rare opportunity to hear directly from someone who has spent time in Gaza supporting children and families. Rebuilding Alliance has already delivered three pallets of solar lights so children in Gaza can safely study and spend time with their families. There are 700,000 children in Gaza. Please join us on Sept. 16th to help Rebuilding Alliance send more Luci Lights to Gaza’s children. We will have a Potluck Dinner in the Social Hall starting at 5:30. Please bring a vegetarian or fish dish to share. And please join us after dinner and the presentation for a spirited, musical Kabbalat Shabbat service to sing, meditate, dance, and rest in the joy and peace of Shabbat. Led by Hazzan Shulamit and Julie Nesnansky. We hope you can join us on September 16 to hear first hand from our guest about her experience personally delivering solar lights to Gaza. But if you can’t make it, please make a donation to this great project!